This Spring has been absolutely lovely. The weather, in what I can only take as a third trimester miracle, has been actual spring weather, for weeks. Usually in these parts we get a few days of glorious spring and then it’s 90F+ and 100% humidity out until November. But we’ve had the most incredible stretch of cool, clear days, just warm enough that the whole of town has erupted in bloom. Our farmer’s market on the river opened up for the season a few weeks ago, and I was pleasantly surprised by all the options, especially the greenhouse heirloom tomatoes that were too beautiful to resist. This morning I picked up tomatoes, asparagus, littleneck clams, fresh mozzarella, garlic, salmon, onions, and collards and we had a spring feast, firing up the grill for the first time this season. In what was maybe the best change-of-season use of collards imaginable (I love collards but I’m a little tired of my tried and true winter collards), we decided to fold the collards and add them to the kabobs. Along with sliced lemon, red onion, and salmon it made a fantastic kabob, coming off the grill tender and bursting with flavor. 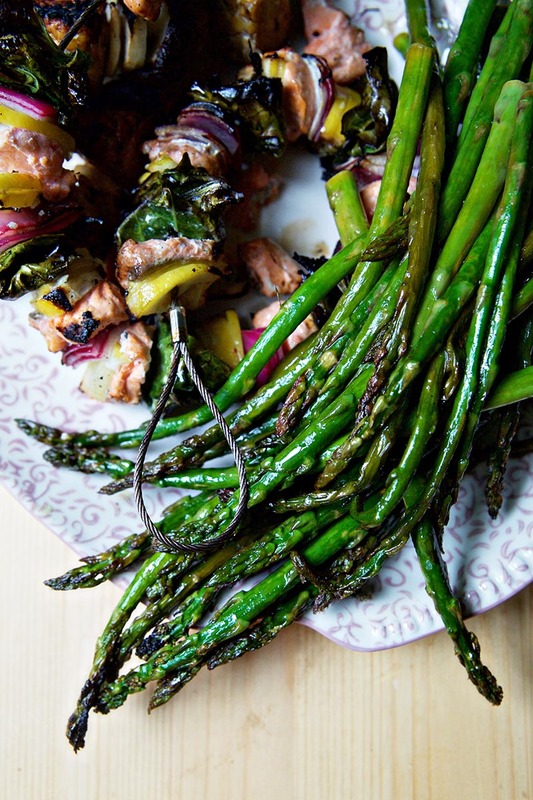 We also grilled the asparagus, with lemon juice and olive oil, and the clams. 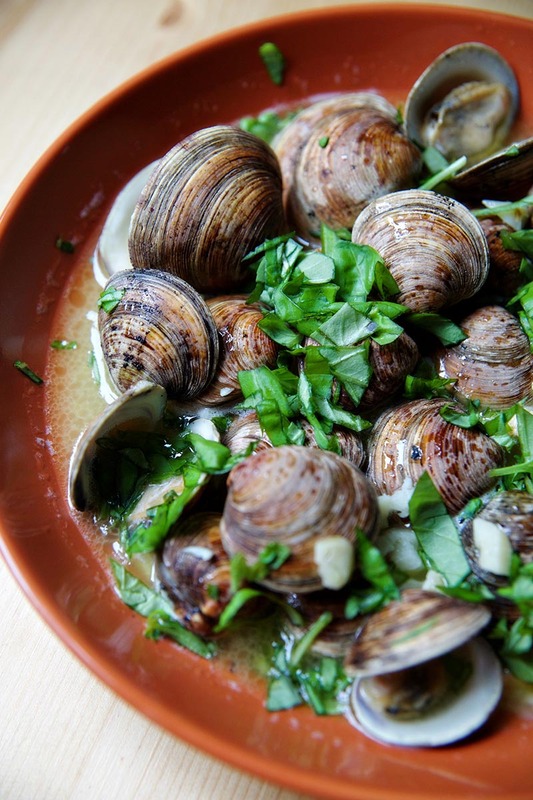 My clam sauce is classic and irresistible- white wine, butter, garlic, salt, basil. 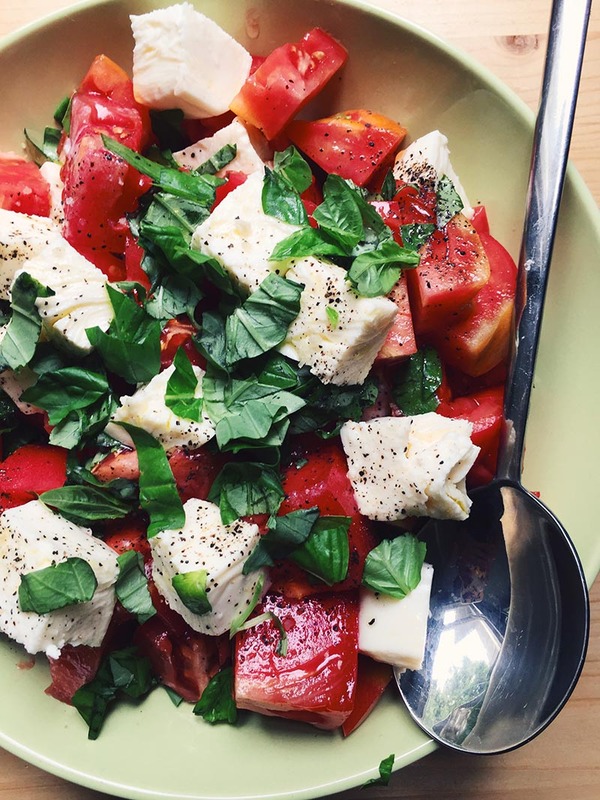 The tomatoes and mozzarella were tossed with olive oil and basil, salt and pepper, and tasted like everything that is good about summer. Eating has been different these past 7 months, and my relationship with food has changed dramatically. It’s been interesting to watch, and a little bit like a roller coaster to experience. With 9 weeks until my due date I’ve reached the place where I’m low on space in my stomach, and I’m finding myself gravitating towards the foods that are gentle on me. I predict that by July this baby will be mostly composed of watermelon and tomatoes. I’ve been thinking a lot the past few months about what I want to happen with this blog, this space. All these life changes- finding out I have celiacs, getting pregnant- have forced me to really step back and have given me the chance to evaluate what this all looks like going forward. I don’t have all the answers, but I have realized something important- I want to share the best of what I have to offer here. So instead of pushing myself to come up with scheduled content, I will be here when I have something valuable to offer, something I think you’re hungry for. 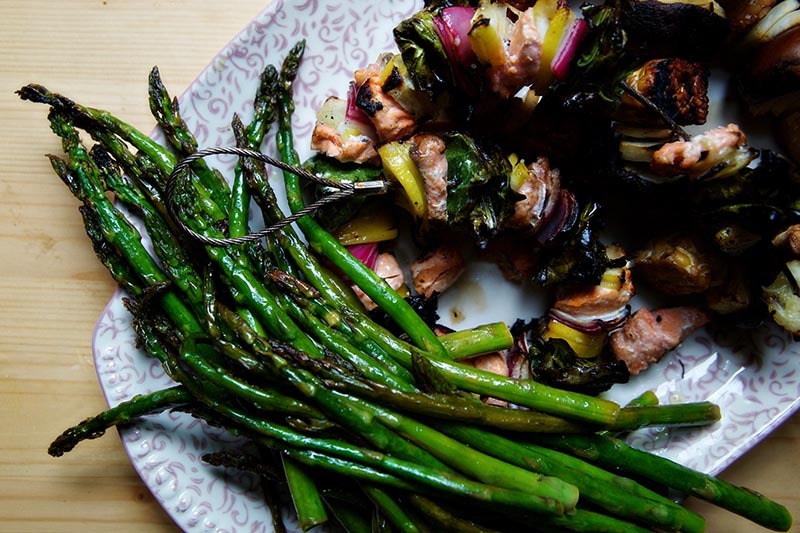 This week, that means clams, asparagus, and salmon skewers. I’ll be back soon with the next delicious thing to cross my table. In the mean time, there are eight years of archives to keep you full. 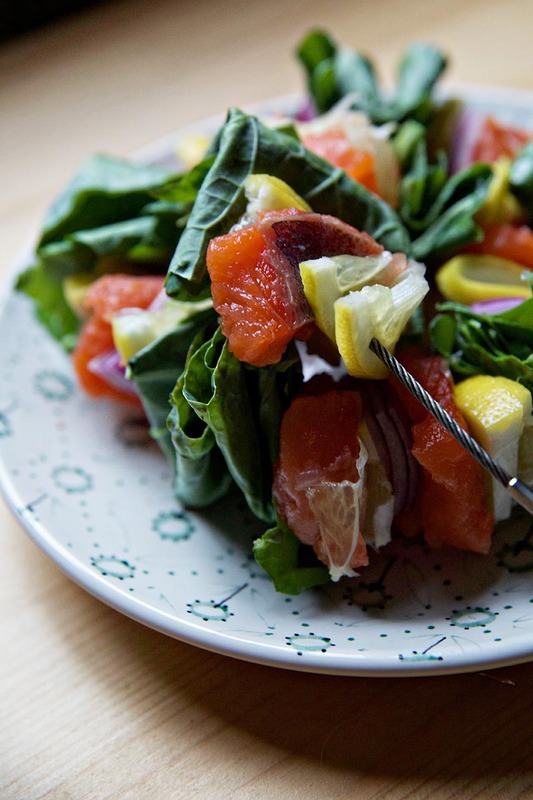 Cut your salmon into cubes, your onion into chunks, and one of your lemons into slices and halve the slices. De-rib your collards. Add your ingredients to the skewer, taking care to pass the skewer through the middle of the salmon and onions and on the rinds of the lemon. Fold your collards into a cube before skewering them. Toss with olive oil, lemon juice, and salt. Allow to marinate 1-3 hours before grilling. Grill 5-6 minutes on each side, and serve hot. Trim your asparagus ends. Make a tin foil boat and toss the asparagus with olive oil, lemon juice, and salt. Grill, tossing occasionally, for 15-20 minutes, or until tender. Beautiful photos! All three recipes sound like spring on a platter to me. I love how the farmer’s markets are all bursting with more and more gorgeous fresh fruits and veggies these days! All beautiful recipes! The salmon is calling me! Gorgeous photos! 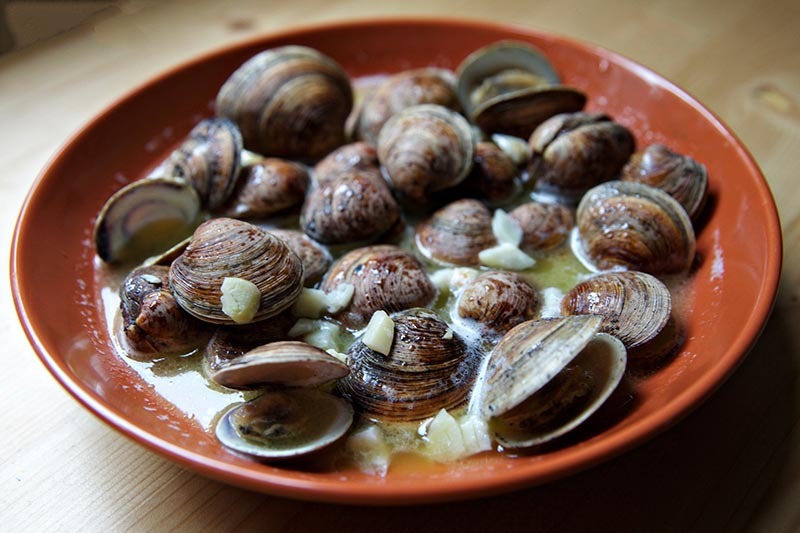 Clams and salmon are my absolute favorite. Such pretty photos! I love your skewered collards! What a fab idea. Your weather sounds like what I get here in Phoenix — without the humidity! Good luck to you over the next several months! Sounds like an exciting time! Looks delicious. Very nice photos.